Choosing an electrical contractor for your home or business can be a frustrating experience. Too often contractors, even if well-intentioned, lack the skill, expertise, or business experience to bring your ideas to fruition. We recognize these concerns and have done our best to address them. From our roots as an electrical contractor in the Detroit area over 60 years ago to our present location in the beautiful Upper Peninsula of Michigan, we can assure our customers of a professional job well done at a fair and reasonable rate with the customer’s needs as our primary concern. We have partnered with some of the finest builders and craftsmen in the area. We enjoy excellent relationships with the local building officials and power companies. When you choose our company, you are leveraging all of these connections that we have spent many years building. Ask your neighbors or fellow business owners about us. Chances are very good that we have done a project or multiple projects in the past with them and they have become part of our extended family. Mandel Electric began in Detroit, MI in 1952, started by William S. Mandel, my father. He had originally started doing electrical work while attending Cass Tech High School majoring in electrical studies. The company was continued on by my mother Frances Mandel who was the only woman electrical contractor in the Detroit area at the time. Will Mandel began work for the family business while still in grade school working in the shop. As he grew older he assumed greater responsibilities. After obtaining a Bachelor’s degree from Eastern Michigan University, he turned his attention full time to the electrical contracting business and became a Master Electrician in 1992. 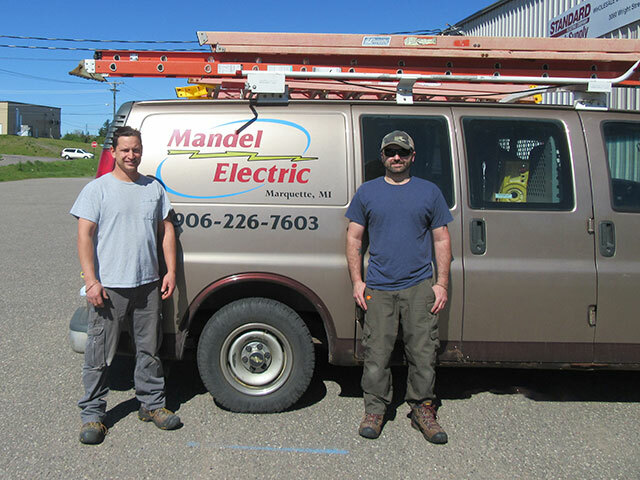 A move to the Upper Peninsula and the establishment of Mandel Electric, Inc. in Marquette followed in 1997. Thanks for doing a very good job and staying on budget"
Choosing an electrician for your home or business can be a stressful decision. We are here to make the process as comfortable as possible and to provide an enjoyable experience. As second generation contractors, we know how to provide quality work that is done efficiently, and we never forget to clean up after ourselves. We want to be your “electrical advocate”. If you've got an electrical project, we'd be happy to provide references and give you a free "no obligation" estimate. 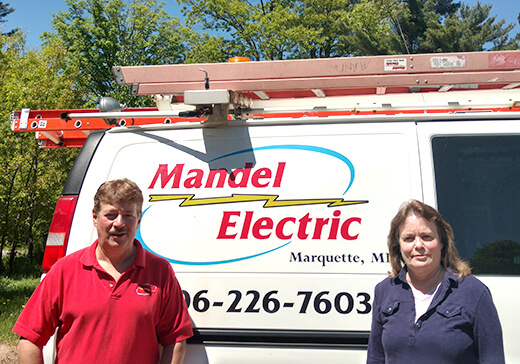 Started in Detroit back in 1955, Mandel Electric has been a family run business operating in Michigan for over 60 years. Will Mandel took over the business from his dad in 1994 and has operated from Marquette ever since. We have many loyal customers who continually trust us with their electrical repairs and installations. Many of our customers also refer us to their friends and family. Our licensed electricians are experienced journeymen who have worked on many electrical jobs at homes, businesses and industrial units. All our work is done to code, so you'll have the peace of mind that your electrical system is safe. We are very proud of the quality of the work we do and we only use quality materials on our projects. All of our work is guaranteed and all components come with a warranty.